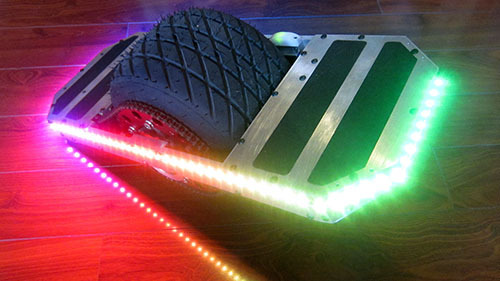 Near the end of 2013 I decided to build another one wheeled balancing skateboard. The first skateboard was a lot of fun, but there were a lot of things I wanted to improve. I was tempted to add features and modify the original, but thought it'd be a lot of fun to have two working skateboards. Just think of the jousting possibilities! There are many great aspects to a project like this. You have to choose the components (batteries, motors, electronics), design a frame and deck to house everything, and figure out how to tie everything together with electronics and software. After months of building, soldering and writing code, you finally get to try the thing out and see how all that work paid off. I tried to stretch my skillsets along the journey. The frame involved some tricky machining, the software is much more complex than the last time around, and the electronics in particular were much more ambitious. Many of these improvements were directly related to the shortcomings of the original skateboard. I wanted a more maneuverable board that was easier to configure. I also wanted it to be able to provide more information to the outside world, so I could understand what was going on while the board was being ridden. Here are the gory details broken down into a few different categories. Note that I don't cover concepts such as filtering, accelerometers, gyroscopes, or motor control in the above topics. You'll want to navigate over to the original skateboard area for more detail in those areas.